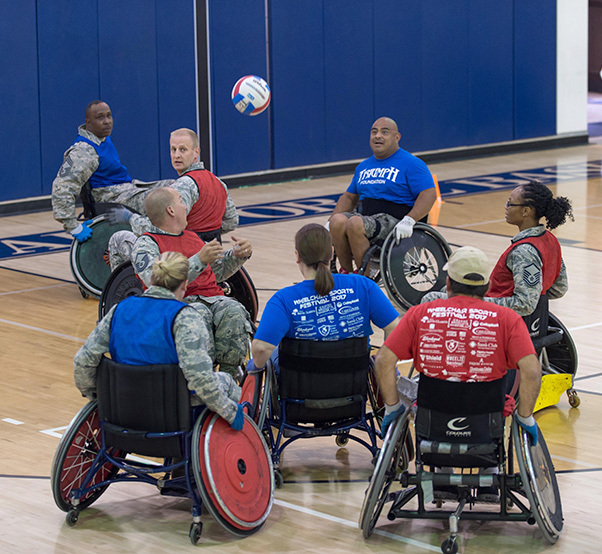 Airmen from Edwards Air Force Base, Calif., participate in a wheelchair rugby game with Triumph Foundation members at the base gym Oct. 24, 2017. 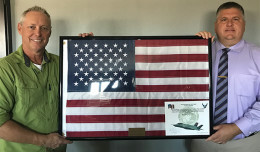 The event was put on in recognition of National Disability Employment Awareness Month. Members of Triumph Foundation dropped by the Rosburg Fitness Center at Edwards Air Force Base, Calif., to put on a wheelchair rugby demonstration Oct. 24, 2017. Airmen from around base got the chance to participate in a game with members of the non-profit organization. 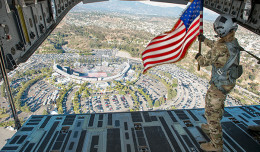 The event was part of Edwards AFB’s National Disability Employment Awareness Month activities. According to the International Wheelchair Rugby Federation and sport websites, wheelchair rugby was originally called murderball for its aggressive play. It is played in dozens of countries and is a summer Paralympic sport. Points are scored by a player passing the goal line with the ball. 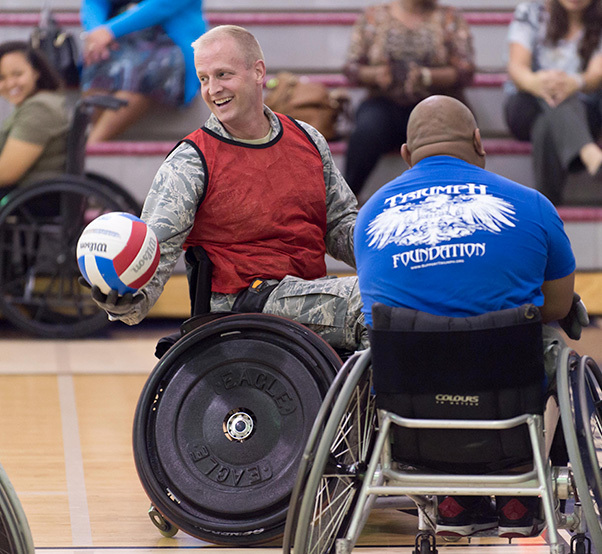 Col. Stephen Grotjohn, 412th Maintenance Group commander, takes part in a wheelchair rugby game at the base gym with members of the Triumph Foundation Oct. 24, 2017. The wheelchair rugby demonstration was conducted as part of Edwards AFB’s recognition of National Disability Employment Awareness Month. According to the organization’s website, Triumph Foundation’s mission is to help individuals with spinal cord injury to triumph over their disability and inspire them to keep moving forward with their lives by pushing themselves to get better every day. Triumph Foundation works to minimize the obstacles that a person faces after suffering a spinal cord injury by providing resources to people living with paralysis – not just initially when the injury occurs, but as a lifelong support network. Edwards AFB’s National Disability Employment Awareness Month committee also held a children’s reading with sign language session at the base library Oct. 20.